Description: Moderately evolute with intermediate expansion rate. The broadly rounded venter grades into rounded flanks with maximum breadth above the middle flanks. Flanks bend narrowly into a steep overhanging short umbilical wall. Ornament on internal moulds is restricted to three constrictions per whorl, which are associated with two collar ribs. Ribs and constrictions are parallel. They are straight and prorsiradiate on the flanks, and cross the venter in a wide arch. On two examples with goethitized conchs ribs superimpose the constrictions. The suture line is moderately complex, E is approximately as deep as the trifid L. Bifid LIE and UIL become subdivided in larger specimens. The sutural lobe is retracted. Its length increases strongly with the growing number of umbilical lobes and the grade of incision. Description. - Holotype of Puzosia haugi is fragmentary composite mold with original estimated diameter of 63-65 mm. Coiling very evolute, with U = estimated 47 percent of diameter and around 30 percent of previous whorl being covered. Umbilicus of moderate depth, with flattened subvertical wall. Whorl section depressed, with whorl breadth to height ratio of 1.16. Umbilical shoulder broadly rounded, flanks rounded, outer flanks converging to broadly rounded venter. 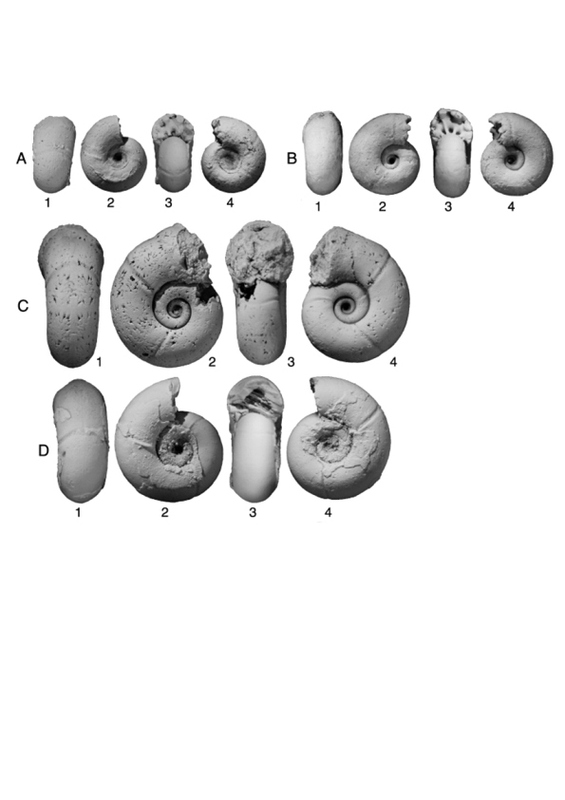 Estimated four narrow, deep constrictions per whorl on inner whorls to diameter of 30 mm. They are straight and prorsiradiate, and flanked by narrow collar-ribs that may be incipiently bullate; flanks otherwise smooth. Two constrictions on outer whorl separated by arc of 100° approximately, straight and prorsiradiate on umbilical wall, cutting deep into umbilical shoulder and prorsiradiate on flank, flexing slightly forwards and concave on outer flank and crossing venter in broad convexity with linguoid peak over siphonal region. Adapical collar rib stronger than adapertural one and bears pronounced bulla in association with last-preserved constriction, while adapical rib associated with first constriction bears siphonal tubercle. (Region damaged at end of specimen.) Feeble and irregular primary ribs present on first part of outer whorl. Nine primary ribs on last part narrow and rounded, and separated by somewhat wider interspaces. Ribs arise on upper part of umbilical shoulder, strengthened and prorsiradiate on innermost flank but flexed back, straight and only feebly prorsiradiate on mid- to outer flank. They weaken markedly on ventrolateral shoulder and efface over siphonal region. Remarks: The umbilicus increases during growth from 27 per cent at a diameter of 8·4 mm to 35 per cent at a diameter of 16·5 mm. 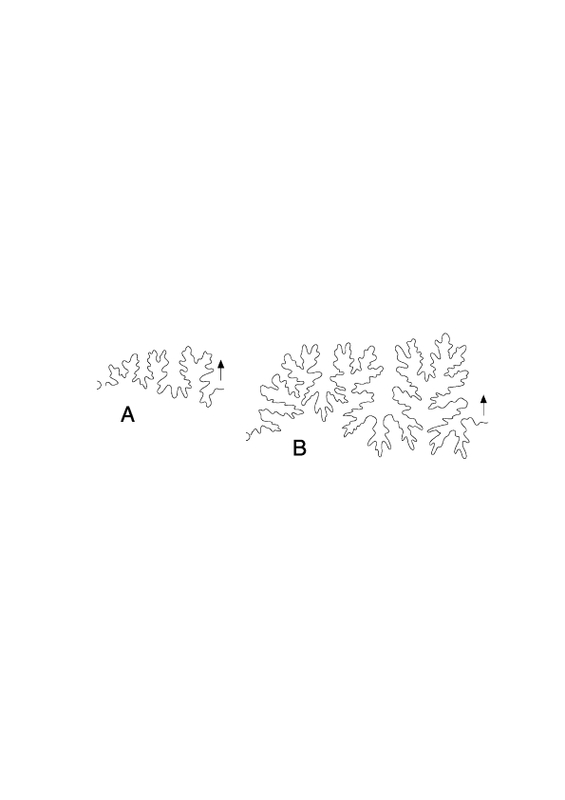 The absence ofumbilical bullae and a depressed whorl section differentiate B. (A.) vishnu from Brahmaites (B.) brahma (Forbes, 1846). Occurrence: Brahmaites (Anabrahmaites) vishnu occurs in the Maastrichtian of southern India (Kennedy and Henderson 1992b), Armenia (Atabekian and Akopian 1970), Madagascar (Collignon 1938), south-west France and northern Spain (Ward and Kennedy 1993). In the US Gulf Coast area the genus Brahmaites was first described by Cobban and Kennedy (1991a) from the Nacatotch Sand, Arkansas, but these specimen have not been determined to species level. Types. - Syntypes are BMNH C5 1026-5 1028, including the original of Forbes, 1846, Pl. 7, fig. 9 (C51026), from the Valudavur Formation of Pondicherry, south India. The holotype, by monotypy, of Puzosia haugi Seunes, 189 1 (p. 20, Pl. 15(6), fig. 1) is an unregistered specimen in the Sorbonne Collections (now in the UniversitC Paris VI), from the "Assize a Pachydiscus Fresvillensis, P. Jacquoti et a Stegaster," Route de Gan a Rébénacq, Pyrénées-Atlantiques, France (Figure 25.1-25.3). Discussion. - We can see no significant differences between the holotype of Puzosia haugi (a composite mold) and specimens of Brahmaites (A.) vishnu from south India, examples of which are illustrated for comparison in Figure 26.1, 26.6-26.8. The extent of the early smooth stage is somewhat variable, being rather longer in the French specimen than some Indian examples, but we take this to be no more than intraspecific variation. The specimen from Tercis referred to Gaudryceras planorbiforme of Bohm by de Grossouvre (1894, Pl. 27, fig. 2) is a gaudryceratid. The specimen from near Alcoy, Spain (de Grossouvre, 1894, Pl. 35, fig. 7) is a B. (A.) vishnu a little larger than the present specimen with coarse ribs, as in some Indian specimens of the same size. We are uncertain of the affinities of Brahmaites mikobokensis Collignon, 197 1 (p. 22, Pl. 647, figs. 2400, 2401), which lacks siphonal tubercles in internal molds from Zululand. Occurrence. - Upper Maastrichtian of Pyrénées-Atlantiques, France. Imprecisely dated near Alcoy, Spain; Maastrichtian of Armenia and Madagascar. Ammonoidea neocretacea . Fossilium Cat, (1: Animalia) Vol. 29 p. 244 pp.